Catching up with the world has never been easier. 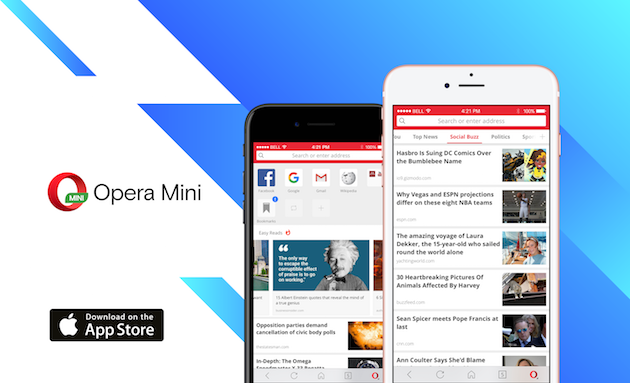 Opera has released a new version of its most popular mobile browser app, Opera Mini, for iPhone users. The revamped user interface features a newsfeed on its start page and helps users get the news four times faster than the previous version. An artificial intelligent (AI) news engine is also rolling out to selected countries, bringing the latest and most insightful news to the user without any effort setting it up. Opera’s AI news engine uses real-time intelligence ranking, powered by machine learning (G.B.D.T. algorithm) and deep learning (D.N.N. deep neural network). Once the user starts engaging with news content, it will begin defining a unique user profile by accumulating news categories and publisher domains the user clicks on. The news engine analyzes the user’s interest through a deep learning model that understands what each user is engaged with. The more the user engages with the newsfeed, the more in-tune the content becomes for the user within the “For You” section. The Opera AI news engine also includes feedback from local editorial teams as the AI news engine is now one year old and rather young. The editorial teams monitor the AI-generated newsfeed in an attempt to identify and remove fake news as quickly as possible. As of today, the Opera AI news engine processes and fetches news in selected countries, such as Ghana, Kenya, India, Indonesia, Nigeria, South Africa, Tanzania and the United States. Furthermore, it will soon be coming to Russia, Pakistan and Bangladesh, too.